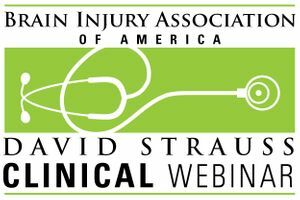 A David Strauss Memorial Clinical Lecture webinar featuring Thomas Bergquist, Ph.D., L.P., Mayo Clinic and Mayo Graduate School of Medicine. Aired live November 15, 2017. The 2017 David Strauss Memorial Lecture webinar series continues to focus on cognitive rehabilitation. In this webinar, Dr. Thomas Bergquist from Mayo Clinic and the Mayo Graduate School of Medicine will discuss the deficits of memory that can occur after traumatic brain injury and best practices in rehabilitation of those deficits.